If you would like us to contact you regarding an appointment, please fill out this form. We promise never to sell, barter or rent your email address to any unauthorized party. We believe a healthy smile is a beginning to a healthy life. A smile not only spreads joy, happiness, and friendliness, but it makes you, YOU! We believe good oral care not only focuses on your teeth, gums, etc but on your nutrition and overall health. We intend to be attentive to your specific needs to help you achieve a healthy smile and healthy life. We will do this by listening to you and developing your trust in us. We believe your smile and well-being are important and are here to guide and help you through life’s journey with a confident smile! 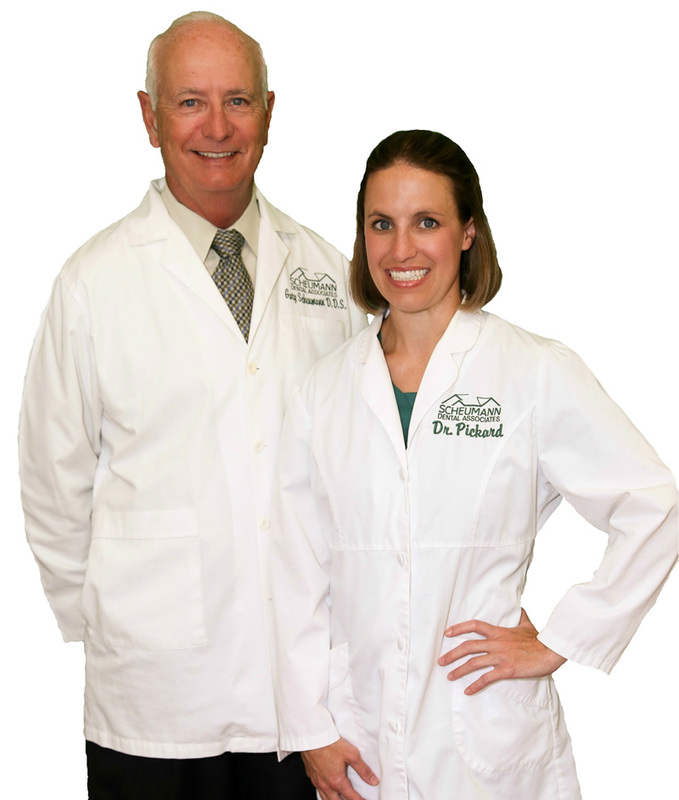 We believe in establishing a trusting and loyal relationship with each of our patients. We will work with you to set goals and then determine the treatment needed to meet those goals. We approach each day with a full heart and strive to maintain the highest care by constantly expanding and gaining new knowledge in the dental field. We invite you to browse our website to learn more about us. Our hope is to show you dentistry can be completed in a pleasant and comfortable manner and to gain your trust and confidence in us so you feel secure in referring family, friends, and co-workers. We look forward to seeing your smile soon! We offer a variety of services in order to help you achieve your goal of a healthy smile. We believe in offering sound treatment through advanced technology and by keeping ourselves up to date on the latest advancements by reading articles and attending dental seminars and classes. Dental anxiety is very common but there are simple ways to manage it. We offer nitrous oxide (aka laughing gas) and conscious sedation. From sealants to tooth colored fillings to full coverage crowns, we can help preserve your teeth. Invisalign, cosmetic bonding, veneers and teeth whitening are just a few ways we help you maintain a beautiful confident smile. From implant retained dentures to partial or full dentures, we are here to help guide you to reaching your goals and needs. Preventative care is very important to maintaining a healthy natural smile. We offer a variety of services to assist you in keeping a dazzling smile and great teeth. Dental implants are a wonderful option to replace missing teeth and restore sound stable function. We also utilize a dental laser to help treat a variety of oral conditions, such as canker sores. A native of Auburn, Dr. Pickard graduated from DeKalb High School before earning her Bachelor of Science degree in Health Sciences at Purdue University in May of 2004. In May of 2005, she completed an internship as a Registered Dietician (RD) in Columbus, Ohio at Mount Carmel College of Nursing. From there she matriculated to Indiana University School of Dentistry in the fall of 2005 and received her Doctorate of Dental Surgery (DDS) degree in May 2009. In June of 2009, she married Brayton Pickard and the couple settled in Portland, Maine, where Dr. Pickard provided exceptional care in a dental office. In May 2011, she and her husband moved to Auburn, IN and she started working here with her father. Since moving back to Auburn, their family has expanded. They welcomed their first daughter, Gretchen, in May 2013; their second daughter, Imogen, in February 2015; and a son, Magnus, in November 2016. They love to spend time together as a family enjoying the outdoors. They especially enjoy downhill skiing, spending time at the lake, hiking/running, and rock climbing. 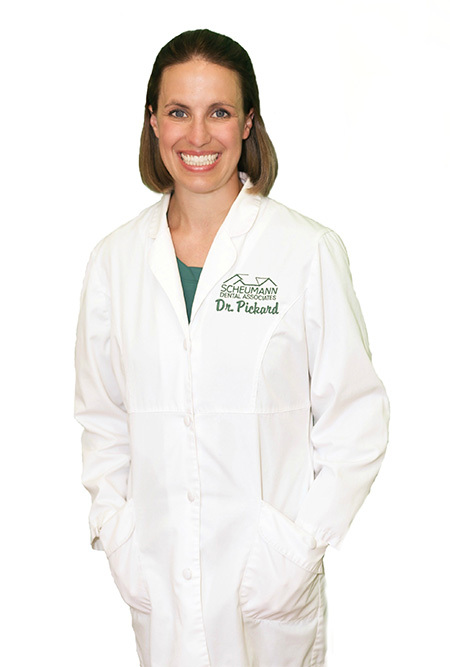 Dr. Pickard is a registered member of the American Dental Association, Indiana Dental Association, Isaac Knapp District Dental Society, the Fort Study Club, the Academy of Nutrition and Dietetics, and the Northeast Indiana Academy of Nutrition and Dietetics. She has had considerable experience in all aspects of family cosmetic dentistry and is an avid student for continuing education. She has additional certification in Invisalign braces (www.invisalign.com) and oral sedation (www.sedationcare.com). Dr. Scheumann graduated from Indiana University and continues education through multiple courses covering all disciplines of dentistry. He is a member with fellowship standing in the Academy of General Dentistry and American College of Dentists, maintaining these through accredited classes. Many hours have been spent with nationally recognized speakers relating to cosmetic dentistry, implants, restorative and reconstructive dentistry and many other disciplines of dentistry including oral conscious sedation and medical management of patients. Dr. Scheumann is an avid student and committed to staying abreast of recent technologies in dentistry. He is also a member of the American Dental Society, Indiana Dental Association and Isaac Knapp District Dental Society. 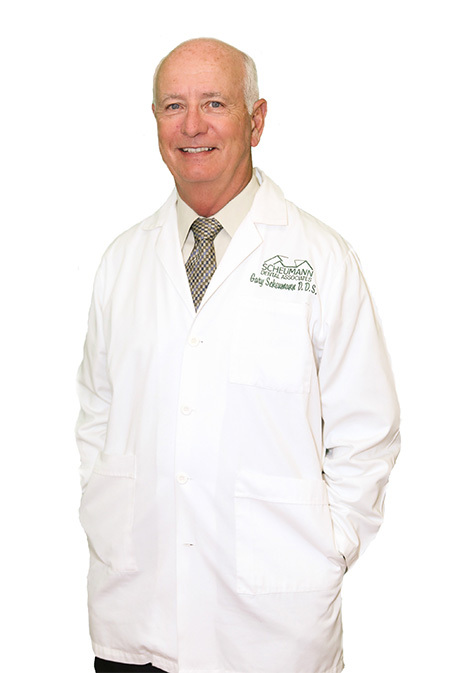 Dr. Scheumann has lived and worked in DeKalb county for more than 30 years and sees patients from all counties in Northeast Indiana, Southern Michigan and Western Ohio. He enjoys time with family and friends. He loves any outdoor activities, including fishing, golfing and excursions with his wife Kathy on their motorcycle. They also enjoy visiting and hiking in our country's beautiful national parks. Send us a quick message and we will be happy to answer your question.